This post contains affiliate links. Also, the jewelry from Lucky Peanut Jewelry was gifted to me, but all opinions are my own. Before I forget, I’m co-hosting a giveaway for a Naked Smoky Palette-–click here to check it out! Today we’re sharing our Snowed in Style featuring boots. 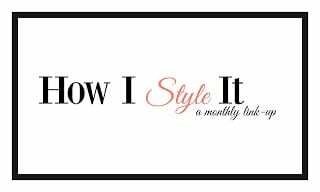 Use the hashtag #snowedinstyle to join in on the fun on social media, and link-up your posts below. 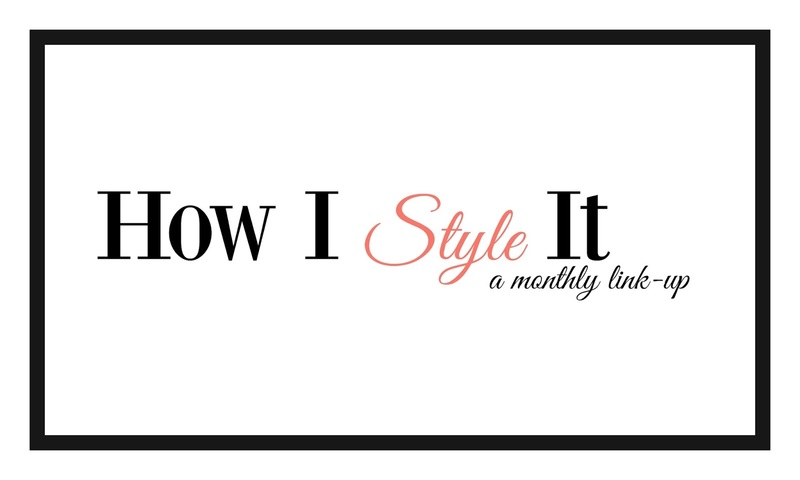 Be sure to check out some of the other looks linked below for outfit inspiration!!! Guys, I hate the cold but love the snow. I unfortunately had just the cold on the day I shot these pictures, but a dusting of snow rolled through that night. Now, I’m not saying I’d like another 1.5 feet of snow, but I’d like a couple of inches on the ground soon. 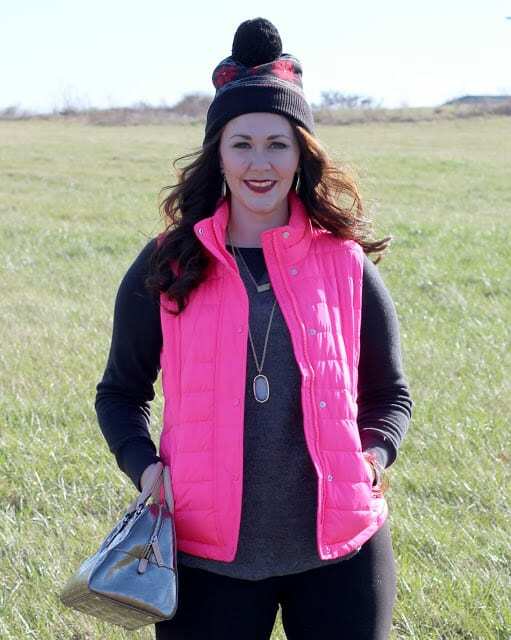 When it’s freezing cold, I like to stay warm with layers–the more the better. You can’t see it, but I totally have a tank underneath my sweatshirt. 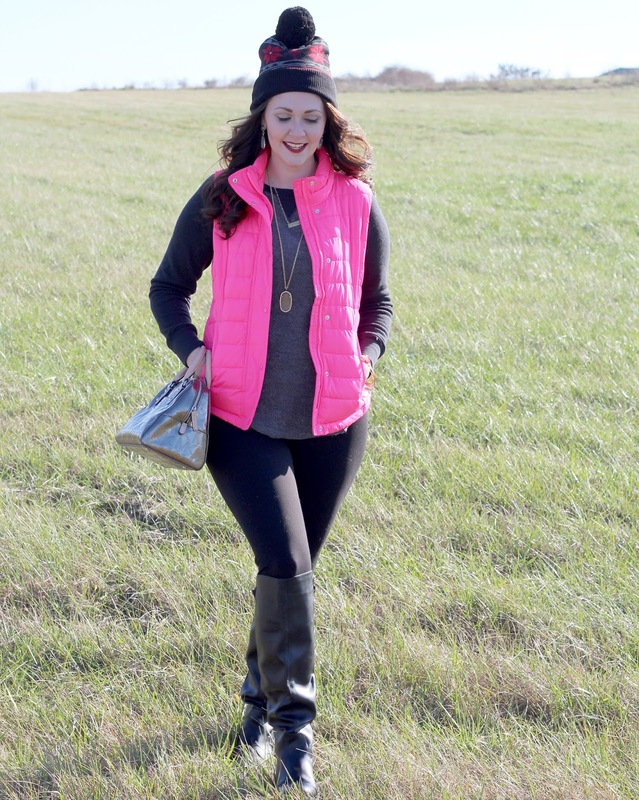 I also like a thicker pair of leggings to pull some boots on over. 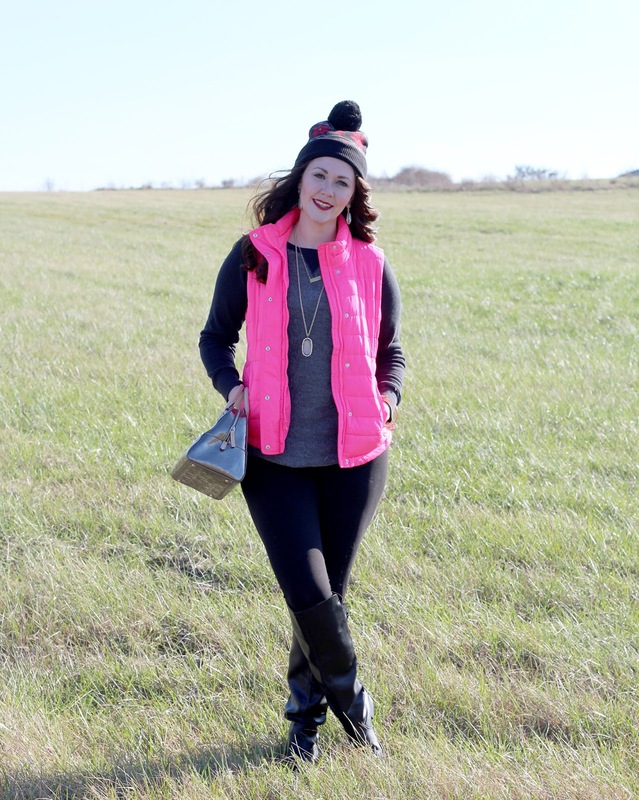 These OTK boots are perfect for added warmth! As for the sweatshirt, I sized up, making it perfect to wear with leggings. 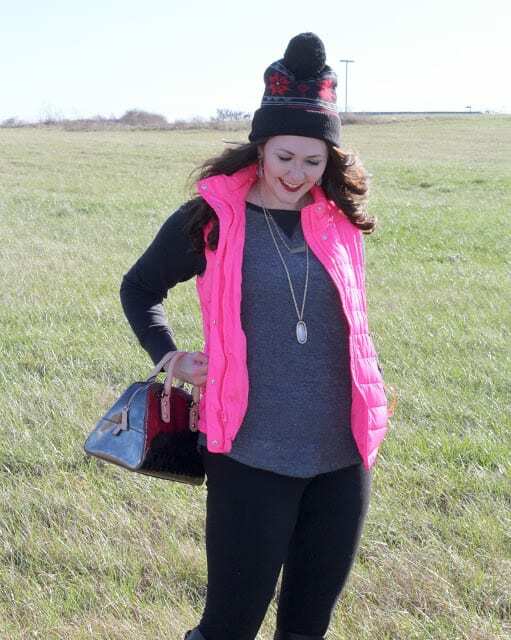 Since my outfit was very monocromatic, I added color in my hat and vest. The hat was a gift from Chauncey’s aunt, while the vest and tunic sweatshirt was a gift from my mom. 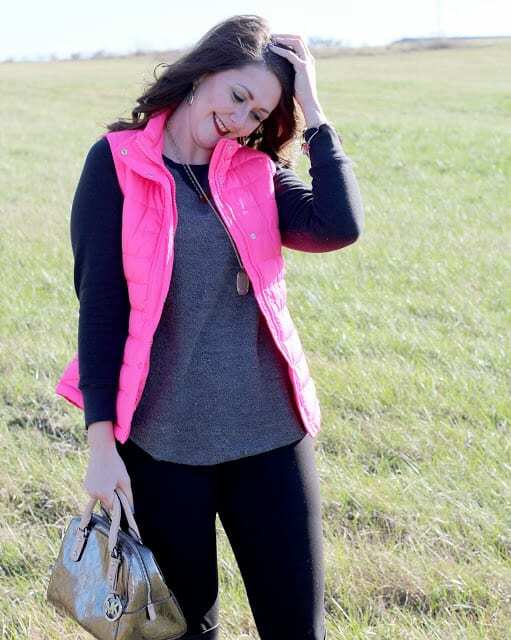 A pop of color is one of my signatures in an outfit. Let’s talk details now. I have been obsessing over gold + gray/silver pairings here lately. 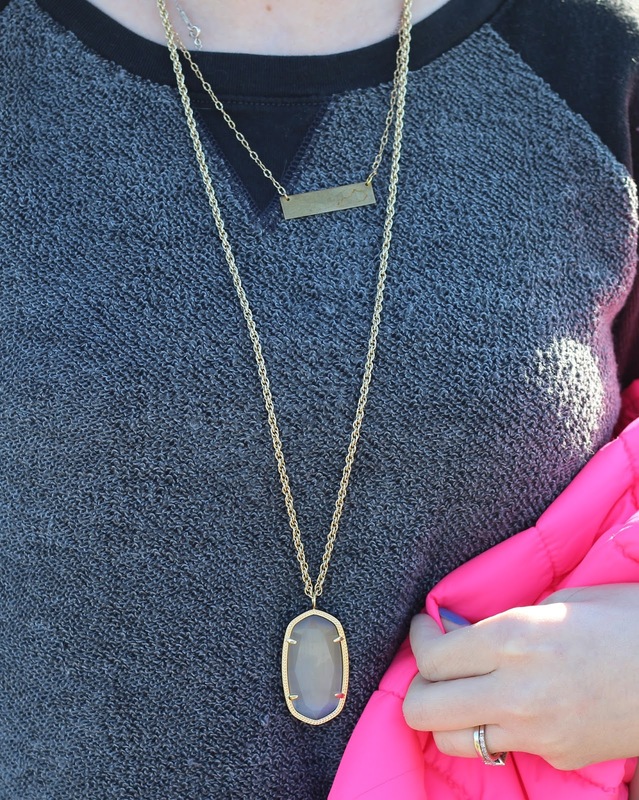 First, this Kendra Scott necklace is such a great piece! The style is no longer available, but you can get this color of stone in the Rayne necklace, which is the same necklace but with a tassel at the bottom of the stone. The slate Rayne necklace is also available via Rocksbox!!! You can read a little more about it here (I also share how I purchased the magenta version of the Rayne necklace for only $29, which is reg. $80!). Use code BRIGHTONABUDGETXOXO for 1 month free! Second, my bar necklace, coin bangle, and Kentucky bangle all come from one of my favorite local shops, Lucky Peanut Jewelry. The bar necklace has a cute little outline of Kentucky hand-stamped on the left side of the necklace and is a wonderful layering pieces. 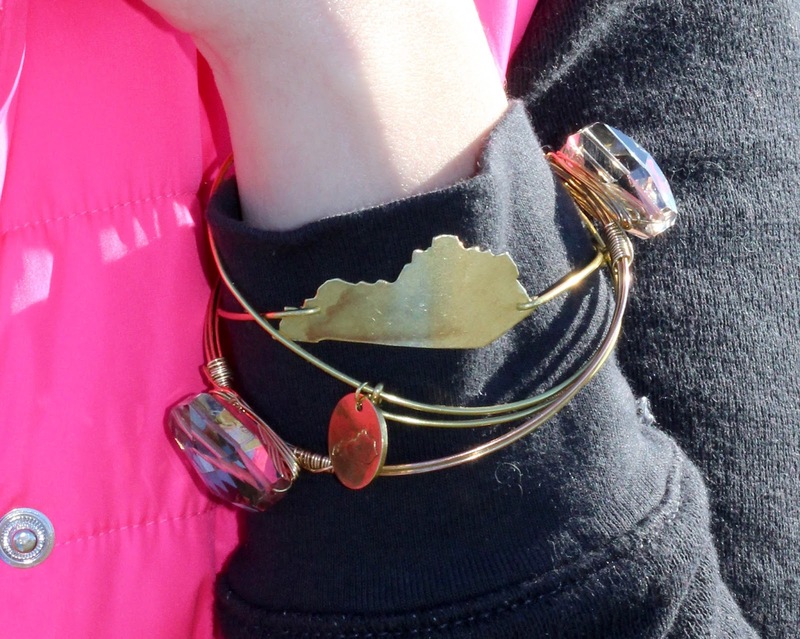 The coin bangle is also hand-stamped with an outline of Kentucky, and both it and the Kentucky bangle are adjustable in size. 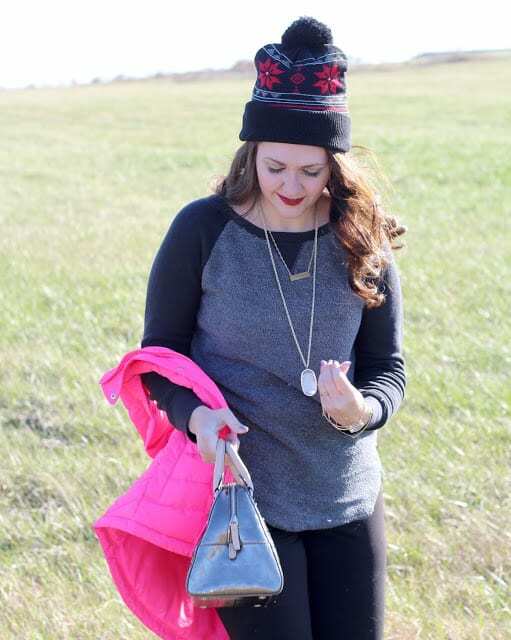 I love these pieces because they’re classy and so fun–plus, with March Madness quickly approaching, they’ll compliment all of my UK apparel:) The best part? You can use code SHOPLOCALKY for 20% off of your entire purchase right now! Now, on to the link-up!! !